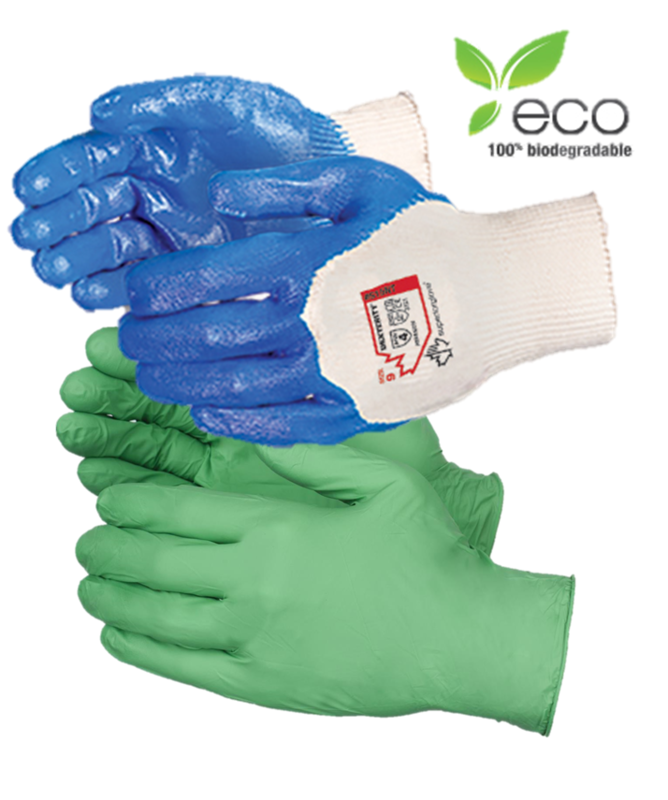 In recent years, the waste disposal problem has spurred mounting interest in the biodegradability of synthethic rubber (nitrile) polymers and in an attempt to eliminate landfill waste, both Showa™ and Superior Glove® have introduced the first of its kind 100% biodegradable work safety gloves. After much hard work and research, a special additive was discovered to create a biodegradable polymer that when disposed in landfills, microorganisms consume and metabolize the glove materials into three natural compounds — organic soil, methane and carbon dioxide. This creates fertilizer and leaves zero waste behind. And here’s the best news, the glove’s physical properties are not altered in any way. For barrier protection and a 2nd skin feel, SHOWA's GREEN-DEX™ 4-mil disposable nitrile gloves will get the job done. Select Dexterity® NT Cotton Knit Grip Gloves feature a 100% biodegradable nitrile palm coating and are ANSI Puncture-Resistant Level 2 Rated and ANSI Level 4 Abrasion Resistant Rated making them ideal for general duty industrial work applications.